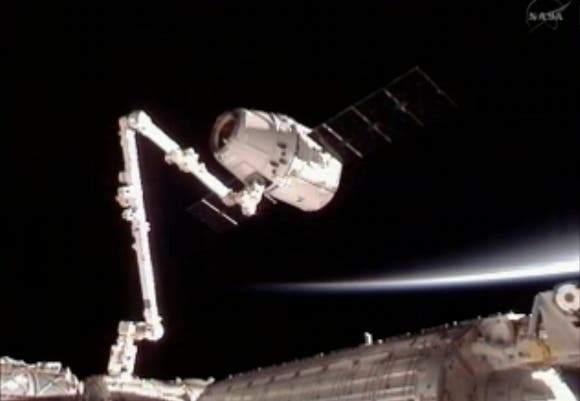 Following what seemed to be a serious problem with one of the engines from the Falcon 9 rocket, the unmanned but highly equipped Dragon capsule successfully latched itself to the International Space Station (ISS). The capsule was capture by astronauts using a robotic arm after what seemed to be a flawless approach – which is really good news, considering that this is only the first in a series of 12 planned missions, which will cost NASA about $1.6 billion. In the almost 500 kg cargo, astronauts also got a rare, last-minute delight: chocolate-vanilla swirl ice cream. The ISS crew was of course really thrilled to see the ship (not only because of the ice cream). “It’s nice to see Dragon flying over the U.S.,” Williams said during the space rendezvous.